Could you Just die for these cheekbones?? Listen, everyone needs a friend (or ten) in their lives who makes them feel absolutely stunningly gorgeous. I have those. I treasure them. But having someone who is in fact, an artist, play with your face is a special experience unlike any other. If you find one that you like, shower her lavishly with all the love and attention she deserves because in return she will bring something special into your life that only she or he can bring. Here's why I am particularly obsessed with Jamie. 1) She convinced me to get the May Lindstrom Honey Mud and the Vintner's Daughter and my skin has never looked better. Plus, not only does she want my skin to look amazing, but she cares that I use non-carcinogenic ingredients. 2) When I'm with her we can (and do) talk about everything. Beauty is a larger concept than a lot of people give it credit for - having a conversation with someone who loves and respects it as much as I do is pure heaven. 4) She's fun AF. Getting ready should always be this fun. 5) THIS. Please forgive my tragic hair - I forgot what it's like to not have bone dry weather and spent all day touching it too much. 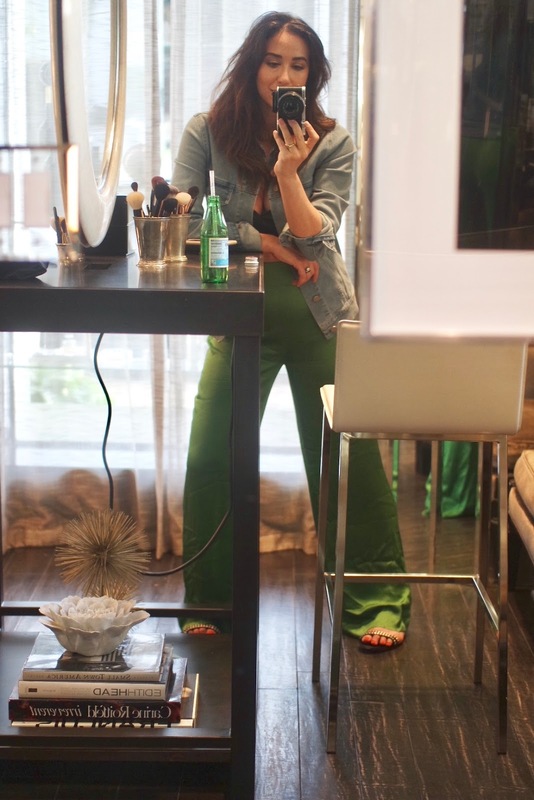 PERRIER PANTs, can you tell I love them. Probably why my camera died, I was having too much fun with the mirrors. Stay tuned... because I think I have pretty much talked her into some guest posts.